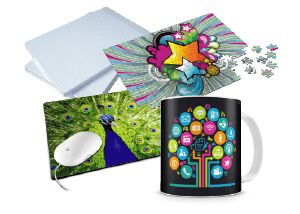 Our HEAT-Press machine will assist you with the transfer of any design or graphic onto fabric. Our HEAT-Press machine boasts a 380mm x 380mm (A3xA3) work area that heats up quickly and evenly using an aluminium heating element. Customise your HEAT-Press project with adjustable pressure, operating timer & temperature. Our quick heating mug press is supplied standard with an element for 11oz mugs (85% of all mugs are 11oz), but it does have an interchangeable head, so you can get the 10oz mug element (for beer steins, sports bottles and tea mugs) as an optional extra. It is easy-to-operate, easy to clean and easy to maintain. It has both digital time and temperature control. And it has a soft heater liner for accommodating inconsistent mugs, and distributing the pressure evenly across the face of the mug.